Can you get addicted to melatonin? 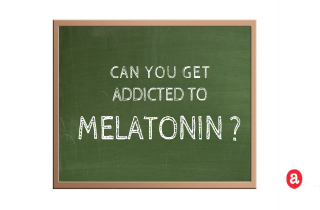 It is unlikely that you can get addicted to melatonin. More on the physical chemistry of melatonin, its uses and addiction liability here. To date, researchers have not documented cases of melatonin addiction. But medications (even naturally occuring hormone supplements) are never entirely “risk free.” Still, therapeutic melatonin is less likely than other sedative-hypnotics to lead to dependence and abuse because using melatonin does not cause euphoria. So what is the relationship between melatonin and the body? We explore here. Melatonin is a naturally occuring neuro-hormone which is synthesized by the pineal gland. Natural melatonin is thought to regulated sleep, mood, puberty, and ovarian cycles. Melatonin supplements are still be investigated for use in people. This is because researchers think that melatonin plays a significant role in regulating the sleep-wake cycle. As a result, melatonin supplements have been used to help people sleep after circadian phase disorders such as jet lag and are being investigated in treatment of seasonal affective disorder (SAD). Whether or not melatonin supplement can treat primary or secondary insomnia is less well established. Therapeutic melatonin may have sedative effects on the brain. Sedation is thought to occur through direct inhibition of a part of the brain called the suprachiasmatic nucleus. But, it should be noted here that melatonin (unlike other hypnotics or sedative medications) DOES NOT CAUSE euphoria, the “high” that people get and seek during drug abuse. This lack of euphoric effect significantly reduces addiction risk and makes melatonin a safer alternative to other sleeping aids. Melatonin supplements are a relatively safe substance when used in the short term: over a period of days or weeks. Furthermore, melatonin has been shown to be safe at relatively high doses and in various formulations. However, the safety of melatonin when used over months and years, remains unclear. Medications and supplements used to treat insomnia and sleep disorders have always been a source of concern for doctors and regulatory bodies. This is because various classes of agents have been associated with risks of abuse, dependency, and toxicity with overdose. But the naturally occurring hormone melatonin is perceived to be more safe. If you are concerned that you have grown physically or mentally dependent on melatonin to sleep, please let us know. You can leave your questions, comments or feedback here and we will answer you personally and promptly. I usually get very affected by most medications. My body seems to be highly sensitive to anything I may ingest or smoke. Dosages of most medications have to be half or less than what others can tolerate. I have been having trouble staying asleep for the past year. I have tried melatonin three or four times for short periods of time and I am convinced that if I take it (only 1 to 1.5 mg) for 5 to 7 consecutive days I become dependent on it and cannot sleep without it. It takes me several days to wean my body off it to be able to fall asleep again. I feel anxious. Can’t sleep without the sleeping pills and xanax. And to make things worse I think I’m getting addicted to them. How can I make myself feel better and sleep better? Hi Caithlyn. I suggest you consult with a doctor so they can make you a tapering schedule. I have been taking 7-10mg of Melatonin nightly for 3 years. Hi Howie. I suggest that you speak with your doctor about this. I have been taking 5 mg melatonin [on some occasions] 10mg daily for approx 2 years. What is the safest way to quit taking it? Hi Mike C. Have you considered seeing a doctor or psychologist? In order to quit and sleep without sleeping aids, you’ll need long recovery until your brain learns normal sleeping patterns and recovers it’s normal chemical function. I’m a 24 year old that has used melatonin since I was 16, on a dosage from 1mg to 10mg. I’ve tried slow release, and regular tablets. But I notice as I age, that my sleep gets progressively worse. Over the years I develop new sleep quirks, like inappropriate and unfixable waking at 2am. My life is exhausting, and it’s impossible to work a standard week. Lately I’ve wondered, could taking melatonin be reducing my body’s natural ability to generate it properly itself? Hi Frank. I suggest that you consult with your doctor about this issue. At what age is this good to start children on? My friend uses it every night on her 6 & 12 year old. I worry. Don’t know what strength. I posted over a year ago when I went cold turkey off the melatonin . It took me a while to get to sleep on my own using natural methods like warm milk or bananas to help. I fell completely better and am back to myself. I still have some short term memory loss but that may be age related . Will never use melatonin again . I’ve been taking melatonin to aid my sleep since I was in about the 5th grade. I am now in 10th grade and still find myself depending on melatonin to help me fall alseep. If we don’t have any or I forget to bring some to a friends house or a vacation, it will take HOURS to fall alseep and I find myself staring endlessly at the ceiling. Is it bad that I depend on them to fall alseep every night? Should I try to break this cycle? And if so, how? I’m a teenager and for the past year maybe two years I have been taking high dosages of melatonin in order to fall asleep. I recently learned of the harmful effects of the supplement and it seems that in my attempt to quit I have grown absolutely dependent on the hormone. My question is will my body ever be able to get back to normal again and produce the hormone. I have been stupidly taking the drug in high dosages because I didn’t know any better but now I’m worried that I can’t fall asleep without it. I am 73 and have chronic insomnia. I was wary of taking the other chemical sleep pills after reading the side effects. I began using 5mg melatonin each night a year ago. It worked OK for a year. Then I began having weak headaches and then relatively strong headaches at bedtime after taking the pill. I decided to stop. The nighttime headaches got very bad but disappeared in the morning after I got up. It’s been two weeks now and the headaches are getting less by the day. I’m no longer using the melatonin and simply lay awake 6 hours each night. I think there is a dependency of some sort when large doses of melatonin are used for long periods. I have been on and off melonotin for about 8+ yrs. My hubby was ill for 7 or more yrs. and then passed away 5 yrs ago. I have had trouble sleeping for years!!! !….i started on the 1 mil. n am up to the 5 mil….i sometimes take a whole one…or a half…that’s my problem too! !…but, my main problem is…I’m trying to quit smoking…(I’m weening off)…i just started today…taking a half tablet to help me sleep….I’ve quit smoking in the past…n i usually get sleepy..when weening off…not this time!!!…. Hi Daniel. It takes some time for the brain to regain back it’s natural way of working. How long exactly is hard to tell since every person’s chemical balance is different. i have been taking circadin 2mg daily for nearly 3 years.I want to stop it because I am afraid it affect my stocmach badly and worsen my depression. I am also tapering diazepam, pt at 2,8 mg.
Can I just stop circadin? Would like to see if it makes me less tired and nonfuntional daytime. I have used melatonin about 2 months, i took 3 mg of dose per day, but now i want to quit so please suggest me a safer way and mandatory tips to leave it safely. I’ve been taking melat5almost everyday since I was 8. I’m 16 now and I’m worried I might not be able to sleep or go to sleep with out wording about not sleeping without it. Any advice? I’ve been taking 1 mg of melatonin every night for 2 months. Should I be concern? I read about melatonin. I have taken 2mg circadin daily for 3 years. I am afraid this has stopped my own production of the hormon. I want to stop because I fear it! And because I also take 6mg valium. Please tell me if can quit circadin without having problems of withdrawl and insomnia? I want to stop, Can I? Or is it dangerous? I know this is a very old doscussion, but I can’t find any information on long term melatonin use and the poissibiity of withdraw symptoms. A quick background….I’ve been taking 6mg of melatonin for several years. A few weeks ago, I got quite sick with an infection and really high fever, so I was sleeping all the time. Since when I was home sick and sleeping all the tine, I never thought to take it. Im a healthy adult and have used melatonin for about three years with no side effects; however I can’t sleep without it now. I feel that I may be dependent on it. I have taken 2mg circadin with 30mg vallergan for sleep for nearly two years. I have now read circadin should only be used for 3 months. Have I problem stopping circadin now? Can I do it without tapering. I am so scared having done a big mistanke! I have bad mornings and wonder if circadin is to blame? What is the right and best I can do about this. Will I have withdrawl if I stop! Please help me! The doctors never told me it should only be taken more tha 3 months! I want to quit, but how? Hi, Wenche-Britt. Experts claim that the safe way to quit medication is to gradually stop taking it. So, I suggest you consult a doctor to help you plan an individualized tapering schedule just for you. I have been using the dissolvable melatonin tablets for quite a bit now. When I try to break off of it I end up staying later than I want to with less time to sleep. When I take the melatonin tablets now I feel like the potency has dropped and it is 10mg. I dont want to take more than the one tablet and I wont. Should I switch to magnesium or something else. These tablets are really addicting, at least for me they are. Hi Robert. Yes, with time and continuous use, your brain becomes accustomed to the presence of melatonin that is administered (and not produced naturally) so you no longer experience the effects as you once used to. It will take some time of not sleeping so well, after you discontinue use, before your brain returns to homeostasis and starts to produce a normal amount of melatonin that will be enough to put you to sleep. You can speak with your doctor or with a pharmacist at your local pharmacy about lowering melatonin doses and possible switching to another medication. Hello, I am 20 years old, and I do beleive I found a dependence on melatonin. Since i was about 17 I had been taking melatonin to help me go to sleep. anxiety medications would always make me dizzy and at the time I was suffering from CVS disorder, and a fair bit of anxiety because of it, so I used meletonin as a quick way to go to sleep before the effects of the CVS disorder would take place as it would always happen at night. The main issue of the disorder; Nausea and vomiting. I had been taking meletonin at least 3/4ths of every month since then. I haven’t had any CVS issues for a while, but I still would be taking meletonin. Sometimes i would take 5mg, others I’d load up on 10. However at times them eletonin wouldn’t help. It would make me go to sleep but I’d awaken 3 or so hours later and not be able to go back to sleep. So i had been riding a roller coaster of 5mg, and 10mg. Recently, it seems that every time I use meletonin, I wake up hours before I should be waking up, with nausea and the inability to go back to sleep, as if I had slept for 50 hours in the 5-7 hour span of time I had slept. It hurts to try to go back to sleep. Right now the nausea is so bad and making me feel emotionally terrible that I came to search for medical stuff online. I haven’t been taking meletonin at all for the past day or so and I have really bad nausea, dry mouth, anxiety from the sleeping thing, I feel cold but when I put on something warm I feel heat sick, and I am shivering a lot as well as being hot to the touch. I thought this was soemthing like a flue but it isn’t as I have had my flue shot, and I’ve taken cold and flue medicine to no avail. I feel like a very long term addiction is possible now, and since I stopped trying to use meletonin I am getting nausea as a result of not taking the meletonin pills. Back then my gastrointestinal doctor told me to take meletonin. So I did. My current doctor always has her schedule filled for months so it’s not like I can just pop in the office today and get immediate help, I’d have to wait until next year. I hope my story can help out the meletonin studies a little so no one else experiences what I’m going though right now. I used Melatonin for about 2 months, I began having lucid dreams shortly after. I developed a complete alternate reality, which managed to come out into my life, resulting in me telling a co-worker I had feelings for them. Nothing became of that, as I soon realized that the melatonin was the issue, so I stopped taking it and that all blew over. I stopped taking it, but I am still having lucid dreams on a pretty regular basis, and my wife has caught me sleepwalking at least once. I am worried that I will not go back to normal and I may do something stupid in my sleep walking. Any advice at all, PLEASE!?!?!?!?!?! Hi Sean. I know what you mean when you describe the lucid and vivid melatonin dreams. I believe that anyone who ever took melatonin has experienced those. I doubt that they will persist forever, as our brain tends to return to its normal functioning after a while. I have been taking melatonin 5mg for close to a year. Recently I experimented with going without melatonin for a week. I found that I was able to fall asleep every night after tossing and turning for a few hours, but noticed a constant headache during the day throughout the whole week. I went back to taking melatonin because I had to get up early for a series of work related trips. Last night I decided not to take it, and I’ve been experiencing a severe headache all day today again. I am pretty sure I am experiencing withdrawal symptoms. I may start experimenting with tapering off melatonin by splitting my pills into pieces and taking 1/2 dose for a week, 1/4 dose for another week, 1/8 dose, etc. Folks, I’m starting to feel there is nothing natural about melatonin. There are underlying reasons why some of us can’t get to sleep or stay asleep. Downing melatonin simply tricks the brain into a rest mode but does not address the real causes of insomnia. And just like Ivana explained, our brain builds new neuro-networks to adjust to the fact that now it does not to produce melatonin because it’s getting it from external source. So when we quit taking it the brain doesn’t know it needs to start producing it again right away, hence all this torture of not being able to sleep properly again. I must agree – this is not a toy for prolonged use… Jet lag, occasional circumstances, but not more than a few days, or else the brain becomes lazy. I’ve only taken it for a couple of months but last couple of night had problems falling asleep without it – its as if the brain just didn’t even bother doing its part, now that is worrisome and I wonder how many night alike this till all the rhythms normalize again. Be very careful and don’t abuse melatonin, it is not as “harmless” as they claim. Google how to increase melatonin naturally (diet, exercise, etc.) and get off of that thing during some long weekend or vacation. I started taking melatonin after I ran out of hydrocodone pills when I had foot surgery to help me sleep. I found that now I can not sleep without taking at least 2 of the 5mg pills. This is double the dose. If I do not take the pills it usually takes me 1-2 hours of tossing and turning to fall asleep followed by waking up every couple hours. I am a 59 year old male who has been using Melatonin for several years, every night, for sleep. Can you tell me if Melatonin can affect my kidneys? I do have a problem with leakage, and it seems to be getting worse. I am working with my personal doctor trying to help this, but nothing seems to work. I am now checking out other sources, such as Melatonin. Should I still be taking it after years? I noted that it appears it is to be taken for a limited time only. I do not take other medications except Sol Polmeto. Should I stop taking Melatonin? I was diagnosed withe insomnia when I was rather young. I’ve always had issues falling asleep. I started buying melatonin a few years ago and have taken it nearly every night, once a night for at least 3 years. I used to be able to fall asleep on occasion without it, but now I can’t. I can be tired, but restlessness keeps me awake. After I take melatonin, I can fall asleep within half an hour. Also, I don’t know if this is a direct sideeffect of the suppliment, but I often have nightmares when usuing melatonin. Thanks for.the article. It was very interesting. I have been taking Melatonin, along with a benadryl every night for almost a year with the benadryl, and over a year with the Melatonin. Last night, because of circumstances, I wasn’t able to take my sleep meds, as well as my Amitriptyline, which causes drowsiness and helps with my insomnia. I literally wasn’t able to sleep for even a few seconds. I was awake all night, completely conscious of everything around me and the fact that I haven’t slept yet. It was awful. It also feels rather uncomfortable knowing that I’m dependent upon my sleep meds. How do I stop taking them so that I don’t relapse and have several nights without any sleep? Hi Alexandra. I’m gonna say it straight away, but I hope you know this is not gonna be an easy process. I wouldn’t advise you to go off all medications at once, but rather to start tapering one down until you completely stop and then start the tapering process with the next medication. The biggest problem will be that you are very likely to experience insomnia, since it’s one of the most common withdrawal symptoms of sleeping medications. I know it’s strange, but when you quit a sleeping med it produces the same effects you use it to treat. If you really want to successfully stop using these meds, you will have to persevere the withdrawal symptoms that may last for a month or more. The good news is, if you can make it through this period your brain and body will start to recover and return to homeostasis, so in near future you will be able to get a good night sleep on your own. I have stopped smoking marijuana recently and have experienced bouts of sleeplessness a result of stopping. I would be tired but as soon as I lay down I feel wide awake. I took melatonin last night and it worked lie a charm. I am afraid I am just replacing one drug for another though and will have the same problem or even worse. I don’t want to take it on a daily basis but I also have to get up at 5:00 am and work 10 hours a day. If I don’t sleep my day is horrible! Is there any guidance as to how much and for what duration to use melatonin for battling marijuana dependency? Hi Karin. You are definitley right about neurotransmitters. Not only are they different during the day in a single person, we all have different levels of neurotransmitters. This means they are not really measurable on a unified scale. As for the melatonin, you can read in the text above, long term use can cause unwanted effects. I have been having insomnia problems waking early for a year. Lots of life changes. Im doing therapy now. I was taking products from a homeopathic for a year including melatonin which increased from one capsule of 3g to two of 6g. Seemed to work in the beginning. Not anymore. I did a urine test for neurotransmitters. I don’t see how they can be accurate since those chemicals change constantly each day or hour I believe). So the product w the melatonin had gaba and 5htp and naturopath said to stop the product cause of the serotonin. I slept terrible. I am taking .25 -.5 klonopin which doesn’t get me through all night either but eases anxiety. So few nights later I tried .25 klonopin and half capsule of the melatonin product. And my usual ps150 . I slept solid 7 hrs. How did it work that time if I had grown tolerant to it? How long of a break do I need from melatonin? I got a scrip for trazadone but afraid to try it after reading things online. BTW this naturopath says you can take melatonin continuously. Any advice?? Hi Jason. It’s possible that you’ve developed a tolerance. I’d suggest that you speak with a pharmacist about this. Melatonin is really meant to be used for short term transitions (like jet lag) and not habitually. It’s possible that you experience a period of difficulty in sleeping if you lay off the melatonin for a while, but after a period, the therapy should become effective again. And look into long term ways to address anxiety…it really helps! Hi Rosie. Well, it’s obvious your brain is dependent on melatonin and can’t get you to sleep. It counts on the melatonin being ingested and doesn’t produce as much on it’s own. That’s the worst part about melatonin use, after a while it makes getting to sleep harder and harder. If you want to quit, you’ll need long recovery until your brain learns normal sleeping patterns and recovers it’s normal chemical function. But, there is hope. Talk to your doctor about treatment options. Hi my name is Rosie, I’m 18 years old and IVE been taking melatonin tablets since I was 10 on a casual basis. But over the past few years IVE had really bad trouble sleeping. About two years ago I started taking them more frequently then for the past year and a half IVE been taking them every night. Everything IVE read says it’s not addictive but I disagree. I don’t know if it’s a mental addiction but I can’t sleep at night if I don’t have one, I got so restless and anxious about sleeping I just can’t sleep. Then when I take a tablet I relax and I fall asleep pretty quickly. I’m worried about what it might be doing to my body and the long term side effects as IVE been taking them from such a young age. I don’t know what to do or who to turn to for help as I don’t feel I can talk to anyone around me. Any ideas? I started using melatonin to help me get off Ativan and it worked..Within a few days I had no more withdrawal symptoms (cold sweats..nightmares..trembling) and now finally off Ativan altogether..While I was happy that my dependency to Ativan was gone..now I feel the need to continue the use of Melatonin! I’ve tried falling asleep without it and was not successful..so now am wondering..is it addictive? I am an extremely light sleeper and while on Ativan woke up late in the morning feeling groggy and still tired. Now with melatonin; I wake up early..5 or 6 o’clock and am able to set to my morning routine without feeling sluggish. I use the ones that melt under the tongue that are 3 mg each..the pharmacist told me that I could take up to 3 times that amount without harm.. What is the recommended dose that is safe but sufficient? Hello Siobhan. Some people who take melatonin may have vivid dreams or nightmares when they take it. Also, taking too much melatonin may disrupt your “body clock”. Since your body has become dependent on the melatonin by now, it will take a while befor your sleep patterns return to normal. See a doctor or a pharmacist if you need to switch the sleep aid. 1. Does Melatonin cause bad and vivid dreams? 2. How can I adjust my sleep pattern by completely quitting taking Melatonin? 3. Is Melatonin bad for a developing brain? I’m younger than 20, if that helps. I have been taking 1mg prolonged release melatonin for several months. When i don’t take it one day i still have a good night sleep. Hhowever, the best day i will usually have and early morning wake up after three sleep hours worth very little sleep afterwards. If i don’t get at least seven hours of sleep i start slowly to fatigue until a few days later where i will completely be fatigue. I took 3mg of melatonin nightly from 2002 to 2012 with no noticeable side effects. In 2012, I switched to 0.3mg nightly after reading research by an MIT professor that suggested that a 0.3mg dose is closer to a person’s normal production and is usually better than a 3mg dose. However, I’ve struggled to completely stop taking melatonin supplements. My concern is that my body can no longer produce melatonin naturally after so many years of taking supplements. Please let me know if anyone has any suggestions or relevant information. Hey. I’ve been taking 6 mg of melatonin for everyday for the past 6 months. Before the 6 months I was sleeping relatively okay but I would always have trouble falling asleep. And I started thinking that I want to get back to going to sleep naturally. So I’ve taken 3mg of melatonin the past two nights, to try and ween myself off, and I’ve woken up after 5 and a half hours of sleep feeling awake and ready to go. This is different from my usual 8 hours thanks to the 6mg. So I’m just wondering if its possible to go back to sleeping regularly, full 8 hours, without the melatonin, or if my body has stopped, and will never be able to again naturally produce the melatonin I need to go back to sleep because my body became accustomed to the increased melatonin supply? Hello Kathy. I wish you the best of luck! There are a few things that you can try to get the mind tired enough to sleep. After all, it’s the activity of the mind that keeps us awake. You can practice heart rhythm meditation, or even alternate nostril breathing. Let me know if you’re interested and I’ll refer you to some practices. Thanks for the info. I still believe that in my case, there was a dependancy. I decided to stop using it, and went through 2 nights of terrible sleep, including a night when it took 8 hours to fall asleep. I have been drinking a cup of hot or warm milk at bedtime, and have been falling asleep much faster than if I were taking the melatonin. I’ve been taking 10 mg of melatonin for the last couple of months, as it takes me 1 to 3 hours to fall asleep. I decided not to take it 2 nights ago and wound up awake in bed for 8 hours, then sleeping about 4 hours. Last night I didn’t take it again, and even though I was quite tired, still couldn’t sleep and wound up taking a clonozipam at 3 AM. I have a small supply of this drug for nights when I’m having a lot of trouble getting to sleep (about once a week) and it takes 4 or more hours to get to sleep. Hi Colleen. Yes – exercise (45 minutes to an hour) every day has helped me. Also, I’ve had great success with herbal homeopathic combinations for relaxation and sleep. Meditation can also help. And acupuncture. I’d suggest that you make a few lifestyle adjustments and see if anything works. I was taking melatonin for a year and a half because I needed to fall asleep sooner, wake up sooner. As soon as I got a new job where it didn’t require me to go bed earlier, wake up earlier, I stopped taking Melatonin. I am now suffering from sleep maintenance insomnia, and I am thinking that it’s because I stopped taking melatonin. Any insight? From what I’ve read, a good nightly dose of melatonin is from 0.3-5 mg before bed. 10 mg doses are used to treat other medical conditions such as cancer, tardive dyskinesia, thrombocytopenia, or prevention of cluster headaches. Very useful piece of information here, thank you everyone. I was actually worried to become a melatonin addicted. My experience is quite positive about the use of it. It’s 2 am here in Ireland and I couldn’t sleep because I’m taking a break from melatonin….well I actually run out. Was wondering through the web to find out side effects, addiction etc…and I can confirm that it’s safe to take it for a period of time. I’m a 40 years old male and I use it, when I’m facing difficult moments of my life and stressed or worried for some reason. It helps me to sleep better and usually have incredible and almost realistic dreams. Definitely a good sleep aid, but I wouldn’t consider to take it for years. Well I’m about to renew my supply and I was wondering if there’s any big difference in terms of effects between the 3mg and 10mg tablets. As I’m used to get the 3mg ones and I find them the perfect size or doses. Hi Angi. How old is your daughter? Also, check in on recommendations for dosing. From what Iv’e read, you should not take melatonin for more than two (2) months at a time, with at least one break of a week, or more. My daughter falls right asleep when given melatonin. Before melatonin she would be up till 3 am easy. Hi. So my girlfriend has been taking melatonin EVERY night for the past year or two. And as of recently she has had every symptom listed above: headaches, dizziness, nausea. Its at a point where we believe that she may have a brain tumor. I did research, discovered this page and now i need to know. Is this a possible reason for her headaches? Also she had slight blurred vision. Hi Sandra. First, I would suggest that you check in with your physician or family doctor. You can get current best practice information for coming off melatonin, plus be connected with local resources about sleep problems. The thing is that you may experience “re-bound insomnia” where it’s difficult to sleep, until you find a balance of lifestyle choices that makes sleeping easier. And it might be helpful to seek help also with a sleep clinic or an MD who specializes in sleep issues. Good luck! Hi Noelle. What about the zolpidem? How long have you been taking zolpidem to sleep? I might be more concerned about this hypnotic than melatonin as a sleep aid. Also, what does your prescribing doctor say? I have been taking melatonin for about 4 months everyday along with ZOLPIDEM I tried once to not take melatonin and could not fall asleep until I did. Previously I was having horrible nightmareswaking me every hour. I, find relief in melatonin. I, just don’t want to become dependent!! Hello Cheryl. Thanks for your question. In its natural form, melatonin is produced by the brain’s pineal gland to regulate the sleep cycle. When the body is working best, the level melatonin in the bloodstream rises sharply, reducing alertness and inviting sleep, and in the morning it falls back, encouraging waking. When needed and taken as a supplement over time, however, the safety of melatonin supplements used over months or even years is unclear. Hi! I have been taking a low dose of melatonin for years now. I have fibromyalgia and have trouble falling and staying asleep. I am also on a low dose of Flexerill and have been for 12 or 13 years. A few years back (on just the Flexerill) I started having trouble with sleep again, so I added in the melatonin. My question is this – does taking melatonin mess with your body’s ability to produce it’s own melatonin? I read that somewhere and now I am worried about it. Thanks! Hi ghaith. My first thought is that, given you CAN fall asleep, to work on making your environment most conducive to sleep. Turning of TV, screens, work, etc. And perhaps even learning a meditation practice. A few lifestyle changes might be what you need. Low doses of melatonin (0.3 mg and 1.0 mg orally) have been proven to help middle aged test subjects get more REM sleep. But before dosing, I’d suggest that you consult your family doctor for more information. Hi Bryan. Thanks for your question. From personal experience, I find that tt’s difficult to re-establish a sleeping pattern after just a few nights off melatonin. And yes, I find that screen time before sleeping can keep my mind active. I remember reading in a yoga and meditation journal that it’s recommended that you stop “working” the mind a few (3) hours before sleep. Although this might not be possible for you, you might also try more exercise in the day. I have no trouble sleeping after running around a bit (playing with my 2 year old son) during the day. But if you’d like to be certain, you can always consult a sleep expert. Do you still work with the same doctors as when you were a child? Also, what’s their opinion about melatonin? When I was in 4th grade, I found out that I was only getting about 30 minutes of cumulative sleep a night. So after many blood tests, the doctor just told my mom to give me melatonin. So for years I took melatonin. Then when I felt like I was tired on my own, I stopped taking it for years (I only took it when I absolutely could not get to sleep for over two hours). I started taking it again last year. I had a job that required me to work at night for so many weeks until I was back on day shift. So I took it most days to help me sleep through the daylight. Then I didn’t take melatonin during the day shifts. Now I am in college and I find myself taking melatonin almost every night. I tried a few nights not taking it and I had a hard time falling asleep. Is that because I go right from working on my computer to bed? Thanks for reading this! Thanks for sharing your experience, Maritza. Have you thought about seeing a doctor or psychologist? It’s possible that underlying medical conditions or mental health issues are affecting your sleep. And congratulations on the decision to stop taking melatonin. I know that when I took it for short term jet lag, my sleep was actually WORSE…and I would fall to sleep but then wake up 3-5 hours later…wide awake. Excellent information. Looks like melatonin should only be used on a temporary basis. Can you get addicted to hookah? Can you get addicted to ibuprofen?